Your own website, online art galleries, social media, and digital stock sites all let artists sell art online as never before, and even develop new income streams via internet-driven technologies. For the savvy artist, the selling possibilities are endless and the outlook is bright in today’s booming online art market. There are many ways you can sell art online, but where you place your works ultimately depends on several factors. From the type of art you create, to the buyer you’re hoping to attract, different online selling tools are best for certain needs. Let’s start by taking a quick look at which online selling tools are best suited for different types of artists and their creative works. We’ll cover each in detail below. Now we’ll explore these primary ways to sell art online, starting with four ways to build the most important tool in your arsenal: Your own website. Then we’ll look at five more ways to get your creative works in front of even larger numbers of online buyers. Every artist should have their own website that’s more than an online showplace. It should be a full-featured online store. Your website is home to your unique brand and there you have complete control. Plus, with your works front-and-center on your own website, you aren’t vulnerable to competing listings, high commissions, or unexpected art marketplace or online gallery closures. Best of all, anyone can launch a gorgeous, modern online store without any web design knowledge or programming experience. If you can log into a website, you have the skills needed to build a full-featured online store with many top web providers. A few are completely free to build and operate, too. And those that aren’t have very reasonable monthly fees. 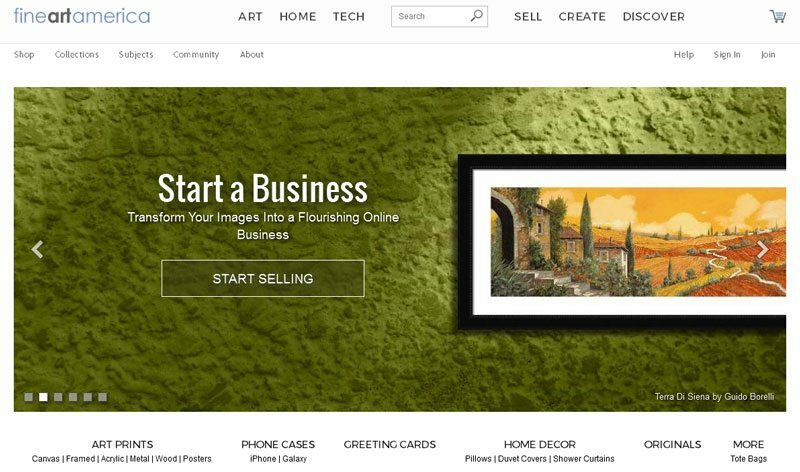 Here is a summary of four simple, proven, and budget-friendly online store systems that let you quickly build a website and start selling your art online. We cover each option in detail below the table. Price: Hosted Plans Starts at $2.95/mo. Store and other plugins start at Free. WordPress is the leading blogging platform and is fast becoming a leading online selling tool, too. With a WordPress site, the sky’s the limit when it comes to design and functionality. Plus the costs are exceptionally low, starting at just $2.95/mo with Bluehost. Click here to read our guide on setting up your WordPress website with Bluehost. WordPress is right for all types of art sales since it lets you display and sell art online just about any way imaginable. Of all our online store options, WordPress allows you the most creative freedom. WordPress also is the best choice for artists who want to actively blog to share updates, new releases, and other information like upcoming gallery shows. It has the a strongest blogging tools of all selling platforms. With WordPress, you can display gorgeous online galleries, sell single finished works or mass-produced goods, take commission orders, sell custom pieces, distribute digital downloads, and even sell your images using print-on-demand services like Printful. Set up your WordPress site with a web hosting provider like BlueHost. We have a guide that will get you started here. Choose an ecommerce plugin that lets you sell online. Our WordPress selling guide walks you through several top options here. Choose a theme (design), then set up your store and enter your products, plus blog content if you wish. Learn about WordPress store design themes in our guide here. As we state above, WordPress lets you do anything imaginable, but its versatility definitely comes with a learning curve. If you’re looking for a simple, super quick way to showcase and sell art online, one of the following options might be better for you. Price: Free Online Store! Pay only credit card processing fees: 2.9% + 30¢ per sale. Square’s main business is processing online, mobile, and in-store credit card payments, but they also offer a free online store with every free Square payments account. Read our article to see how easy it is to build one. In fact, Square offers more than that with every account. From mobile credit card swipers, to point-of-sale systems, to store management tools, Square provides everything you need to run a business with minimal costs. In most cases, all you pay is credit card processing fees on your sales. Click here to learn all that Square has to offer. Square’s payment and sales management tools are right for any artist selling online and/or in-person. Its free online store feature is a great option for artists who want to sell up to 50 finished items, mass-produced pieces, or digital download works on their website. Square is a simpler solution than other online stores and lists items all on one page. That’s why we say it’s best for artists selling around 50 items or less. More than 50 can make your page quite long. You can categorize and sort listings any way you wish, but they all appear in rows on a single web page. Item listings do open in a pop-up page when clicked, so you can show plenty of item details. But you can’t create categories on different pages using Square’s online store. That said, what Square does, it does incredibly well. 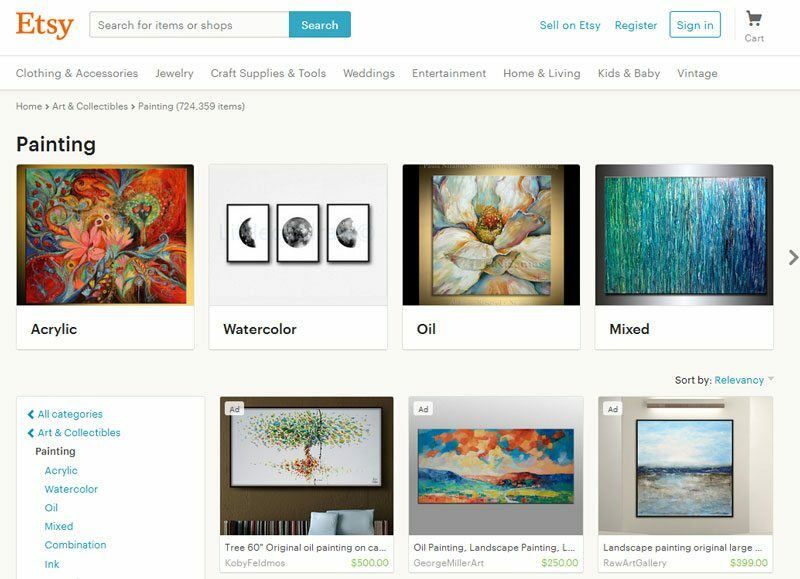 With Square’s free online store, you can easily set up your site, add products, choose a website address, and start marketing and selling your art online within an afternoon. It’s mobile-friendly, too. Square is an especially good choice if you want to sell art both online and in-person in your gallery, at art shows or markets, and through other in-person means. All of Square’s payment options; online, mobile, and in-store point-of-sale, neatly tie your entire business together, leaving you more time to create. First, you need to open a free Square account here, which gives you the ability to accept credit card payments right away. Then you just click on the Online Store tab in your Square dashboard and start adding products and building your site. It’s that easy. We even have a guide that walks you through setup in eight easy steps. As we state above, Square doesn’t support multi-page websites, so if you want to list large numbers of works or mass-produced products, it’s not the best choice. Also, it doesn’t offer blogging features or support orders for customized goods. If you’re looking for a way to list and sell art in volume, easily sell customized goods, and even blog, our next option might be the right fit. Price: Starts at $29/mo. 14-day free trial, see all pricing and features here. Shopify is the most popular full-featured ecommerce platform for small business. And that’s what selling art online really is — a business. Shopify offers a full range of display, marketing, online selling, social selling, order management, and customer follow-up tools, all in one easy-to-use, low-cost system. Shopify is a great choice for the artist who is, or is planning to, sell in volume. Being a top ecommerce platform, it’s chock-full of features designed to make online selling an organized affair. Whether you produce and sell installation pieces, mass-market works, customized items, print-on-demand goods, or digital downloads, Shopify makes it all hassle-free. It also make selling on Facebook, Pinterest, and Amazon push-button easy. First, you need to open a free Shopify trial account here. After that, Shopify’s new store tutorial will walk you through every step. By the end of the tutorial, you’ll have set up everything you need to launch, from accepting payments, to shipping methods, to your first product listings. You can learn more about selling on Shopify and their pricing levels in our guide here. 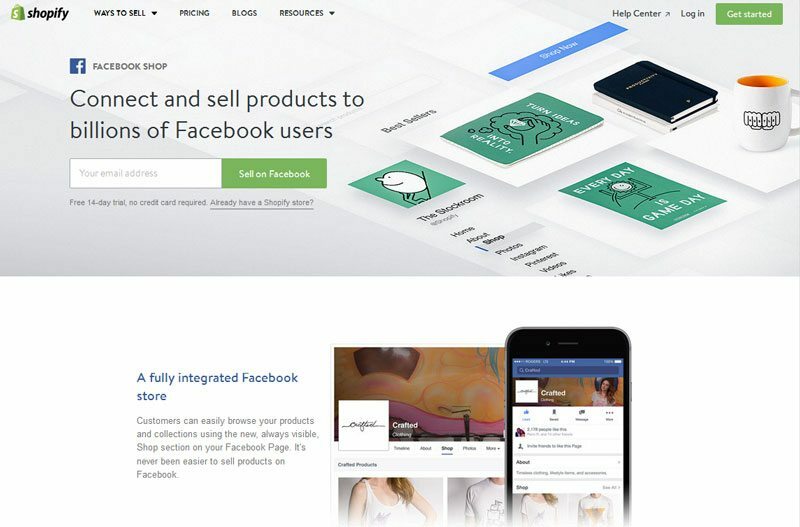 Plus, see how Shopify make it easy to sell on a Facebook Shop here. Shopify is designed for volume selling so it comes with a higher monthly fee than others on our list. But if you need Shopify’s volume-selling features, it’s worth every penny. And if you want to be really picky, their blogging tools aren’t a match for WordPress, but are suitable for basic blogging needs. If you sell just a few investment pieces, commissions, or special orders each month or year, less costly website options from WordPress or Square may be better choices. Price: Starts at $8/mo. Specific platform costs and free trial options listed below. Here’s another artist website option to consider: artist-run web platforms.These are ecommerce website platforms created and operated by artists and tailored to artists’ needs. Like our other three options, they support a range of features, including showcasing your works, accepting online orders, marketing on social sites, and blogging features. Plus, being artist-run, they offer some industry-specific benefits over our other options. 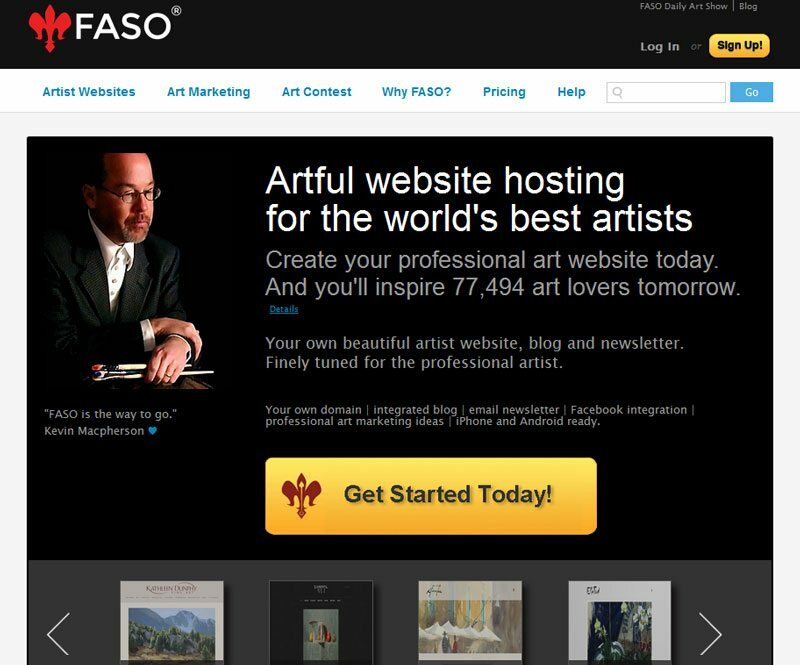 For example, some, like FASO, make your website part of a larger community, provide marketing, and even host monthly competitions. Price: Starts at $8/mo. 30-day free trial, see all pricing and features here. Price: Starts at $16/mo. Two-week free trial, see all pricing and features here. Price: Starts at $12.79/mo. 30-day free trial, see all pricing and features here. Features-wise, artist-run platforms offer much of the same selling and promotion tools as website options 1 through 3. However, they’re run by smaller groups and their overall selling features may not be as broad compared to mass-market platforms. That said, artist-run platforms are designed specifically to help artists sell their works. But remember, each offers a different set of online art selling and marketing features. If you’re considering this option, you should visit each platform’s website to see which group more closely fits your specific art marketing and selling needs. We’ve covered four different ways that you can take that first important step towards selling art online: Setting up your own website. Of the options discussed above; WordPress sites, Square’s Free online store, Shopify’s volume-selling platform, and specialty artist-run art marketing sites, one is sure to meet your selling needs and budget. So now let’s look at other ways you can get your works in front of the buying public. Along with your own website, you can sell art online through a variety of online marketplaces. These are large websites that allow independent sellers to register an account and list works for sale any number of ways. The benefit is they work hard to bring customers in so you don’t have to. But a downside is you’re one seller among many, and there’s a lot of competition for buyers’ dollars. Some, like art-focused marketplaces, cater to specific art-buying audiences. Others, like Etsy and Amazon, bring your works to the masses. Then there are specialty markets that allow you to sell digital images via download, and print-on-demand outlets that put your images on apparel and household items. And don’t forget the power of selling on social media sites like Facebook and Pinterest. Usually a commission-based or listing-based price structure Finished works. List items for sale and even create a Facebook store by connecting your online store to social sites. Taken as a whole, this list can seem overwhelming, but don’t panic! You don’t have to use all of these methods to successfully sell art online. In fact, focusing efforts on your own website first, then one or two appropriate avenues usually is the best way to be seen, sell, and still find plenty of time to create. Art marketplaces are the art galleries of the online world. Some are very selective in the works they promote, while others let anyone post listings. Most art marketplaces do the selling for you, much like a gallery. The client places the order online, you ship the piece and provide proof of shipment, and the marketplace pays you, less their commission. Speaking of commissions, these can be quite hefty, as much as 30%. What do you get for that fee? Many things. Art marketplaces are in the business of marketing art. The more of your works that they sell, the more money they make. Since many are destination sites for serious art buyers, your works are exposed to a broad audience of paying customers. Seeing your listings, customers might just search your name and find your website, too. Plus, your creations are listed alongside other artists of note. It’s always nice to be in good company. Price: $0 Listing Fee, 30% Commission. Learn more here. Artfinder markets and sells the works of more than 9000 artists throughout 100 countries. 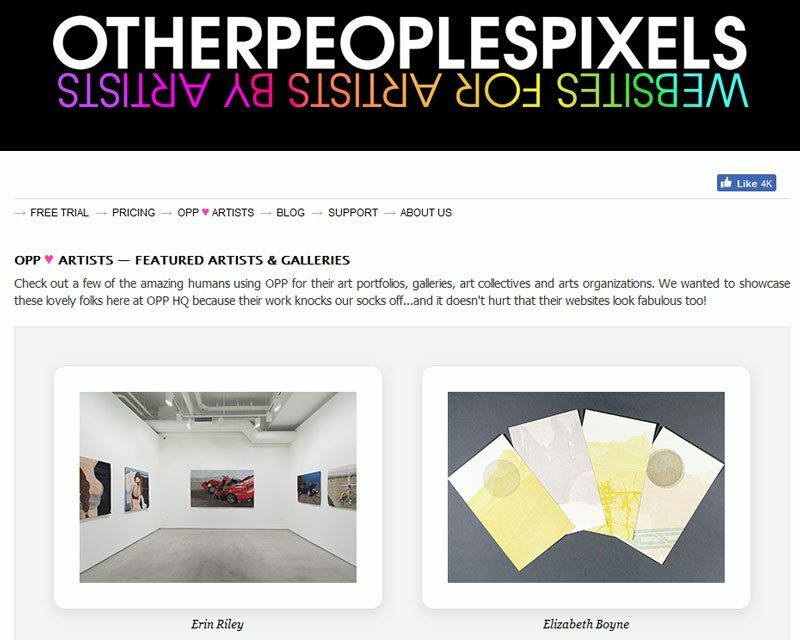 They make it very easy to list your works on your own gallery pages within their marketplace. When a sale is completed, you ship the work to the customer. Shipping and taxes are added to customer orders at purchase, so you’re covered there. After a 14-day return window, Artfinder pays you, less their 30% commission, via PayPal or bank transfer. Price: $60 Listing Fee, 0% Commission. Learn more here. 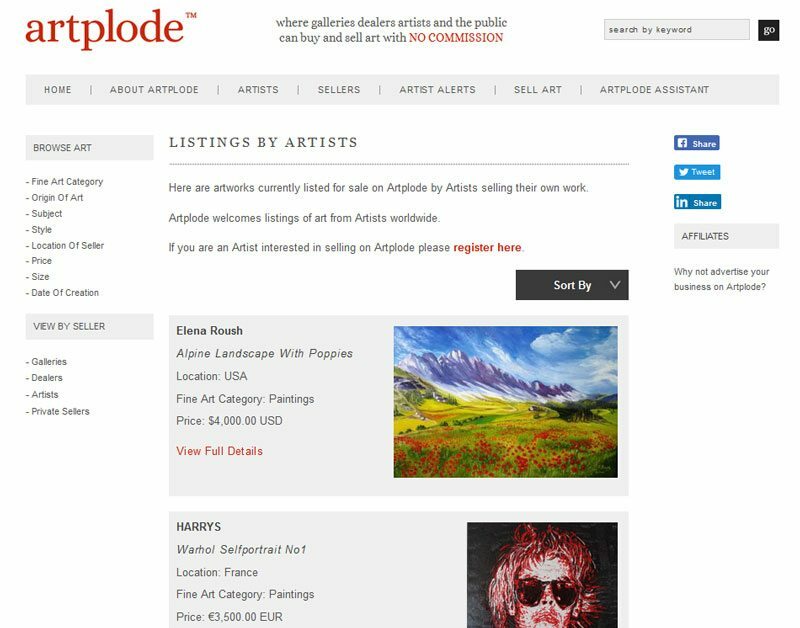 Artplode is an open, zero-commission online art market that welcomes listings from artists, galleries, private collectors, and dealers alike. It tends to cater to higher-priced works and fine art. It’s definitely an online market to consider if you’re selling original works that command higher prices. 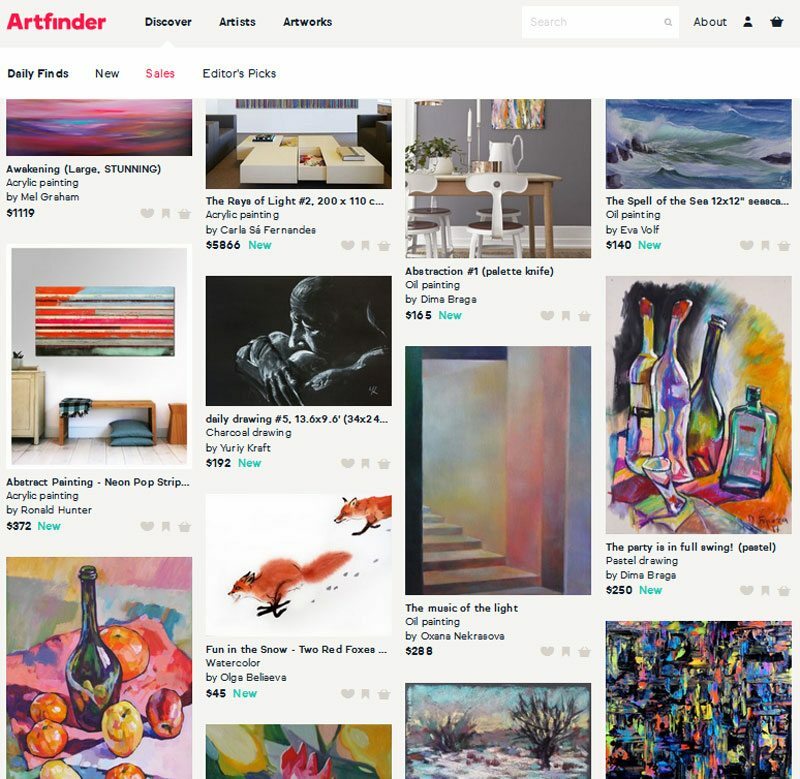 Artplode also helps artists price their works through its Artplode Assistant, an optional service that’s lower-priced than similar gallery services. However, you pay these fees plus the $60 listing fee whether or not your work sells. But that’s all you pay. There are no additional commissions charged upon sale. Price: Set by you, varies by product. Learn more here. 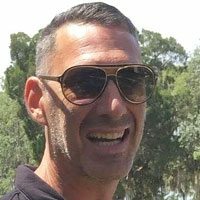 This online seller is a bit different from fine art online marketplaces, but worth a look if you want to sell original images, illustrations, prints, and more. In fact, this print-on-demand art gallery lets you upload your creations so people worldwide can purchase them printed any number of ways. From wrapped canvases to tote bags, greeting cards to apparel, you can add your art to a huge number of marketable goods. And you never have to lift a finger to produce them. You set the price, they add their markup, produce the item when ordered, ship it, and handle the customer service for you. You can create your own website on their system to feature your works on their products. Or, you can list and sell their items on your Shopify store, Facebook page, and more. If this income stream sounds interesting, definitely check this one out. Large online marketplaces like Etsy, Amazon, and eBay are other avenues for selling art online. Like online art marketplaces, these sites handle the selling process for you. They accept and process payment for an order, you ship it and provide proof of shipping, and they pay you less a commission. Compared to art-focused marketplaces, the commission costs are much lower. However, they don’t target the art-buying audiences as do the art marketplaces. Etsy is known for all sorts of artisan-crafted goods and attracts buyers looking for something unique, though not typically collector types. Amazon is a great way to sell items with mass-market appeal in volume. eBay is a mix of both. There, you can easily auction or simply sell a single item or hundreds of the same item. But compared to the others, eBay listings can take a bit more management. Plus, eBay shoppers typically are looking for a deal. Price: 20¢ Monthly Listing Fee, 3.5% Commission. Learn more here. With their low listing and commission fees, the Etsy artisan marketplace is a great way for artists to get their works in front of millions of shoppers each month. Price: From 99¢/item Listing Fee for individual sellers to $39.99/mo Flat Fee for business sellers, plus 15%- 40% Commission. Learn more here. You might want to consider selling art on Amazon since, as of 2016, they account for nearly half, 43% to be exact, of all online purchases in the US, as reported by Internet Retailer. The buying audience definitely shops Amazon. If you ship mass-produced pieces in volume, you can even let Amazon do the shipping for you through Fulfillment by Amazon (FBA). Learn more about that option here. With Amazon, you can get your works in front of millions of potential buyers, but its fee structure can be tricky. Items in the Independent Design and Handmade Item category, which artwork may fall under, can have a whopping 40% commission! However, you can sell prints and other pieces under the Home Decor category for a more reasonable 15% commission. Price: Monthly Listing Fees: Free for the first 50 listings, 30¢/ea. over 50, plus 10% Commission on all sales. Plus additional fees for special listing needs, learn more here. eBay is another shopper destination site where you can sell individual pieces or multiple items. You also can sell art online at a set price, via auction, or even accept offers, which are nice options. Reasonable fees (especially compared to Amazon!) make it a popular way for artists to get their works in front of buyers seeking new, unique, and one-of-a-kind items. This process is called print-on-demand (POD). When the item is ordered, you collect the payment on your website, and release the order to the POD vendor. 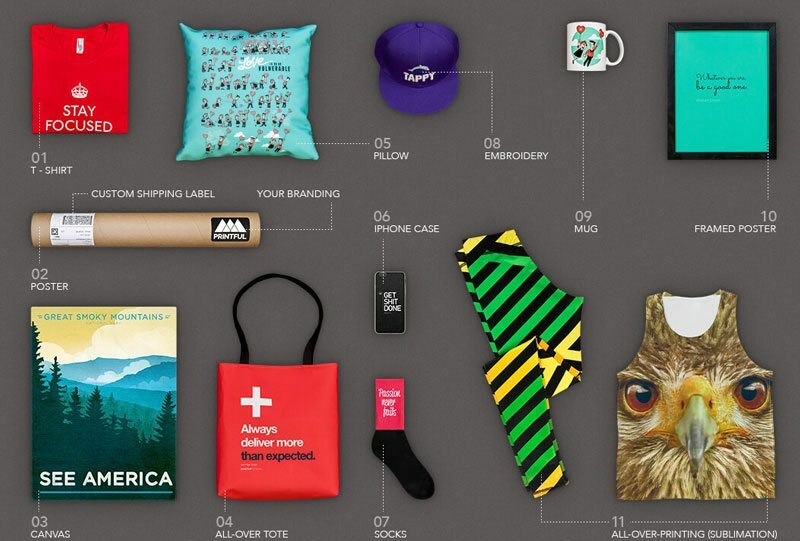 They print that one item using cutting-edge digital printing technology, then ship it direct to your customer. You are charged a wholesale fee and the rest is your profit. I am a big fan of Printful because they offer great quality, a nice selection of products, way higher profit margins than most on-demand printers, and the ability to sync up with Shopify. With POD vendors, you can monetize your works however you wish on mass-market goods. Most vendors, like Printful and CGProPrints, work directly with ecommerce platforms like Shopify and Ecwid for WordPress so you can sell your art on their products without any upfront production or costs. But you also take care of the sale and customer service. Another top POD option is Fine Art America, which we already discussed in detail above. 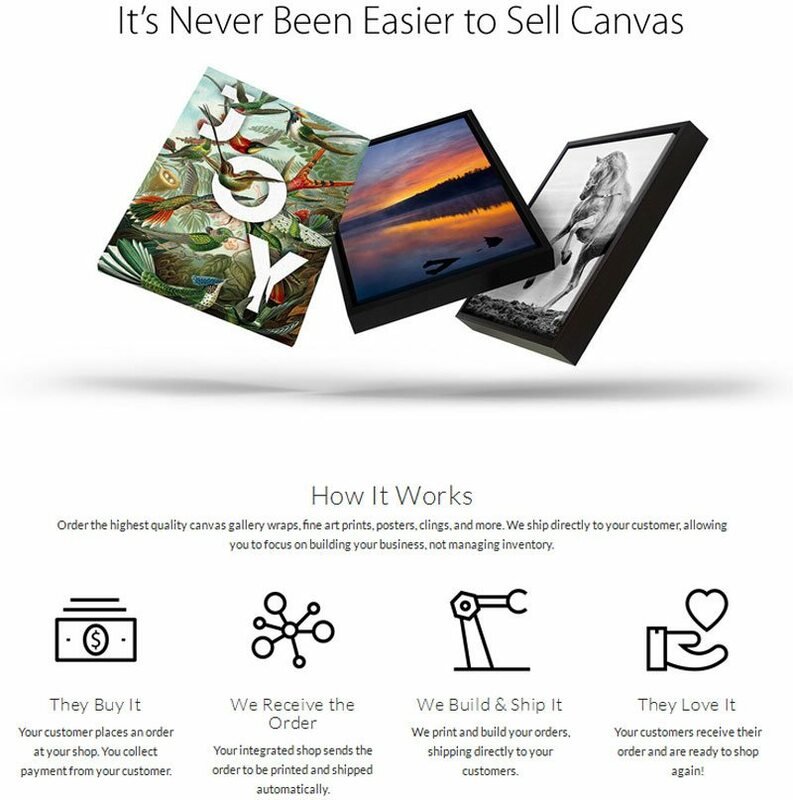 It’s actually a print-on-demand art marketplace that puts your art in front of millions, plus handles the sales, production, and customer service for you, too. Overall, POD creates entirely new ways to make money with your art. But wholesale costs can be rather steep and leave you little room for profit. If you find a thriving market for your art on specific goods, you might consider producing and shipping them yourself to maximize your income. 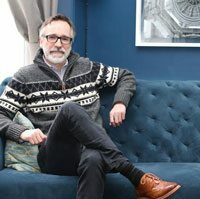 Photographers, illustrators, and graphic designers can sell their downloadable works online through a number of specialty marketplaces commonly known as stock houses. These marketplaces cater to the commercial user, so your imagery can be purchased and downloaded for use in a number of outlets including advertisements, websites, and other marketing materials. Stock houses sell your images and pay you a percentage amount based on usage. They determine this through different licensing agreements, which they buyer agrees to upon purchase. Most agreements include attribution, so this can be a good way to get your name out there, too. Each stock house has its own pay structure, but here’s a look at BigStock’s seller fees to give you a idea how they work. 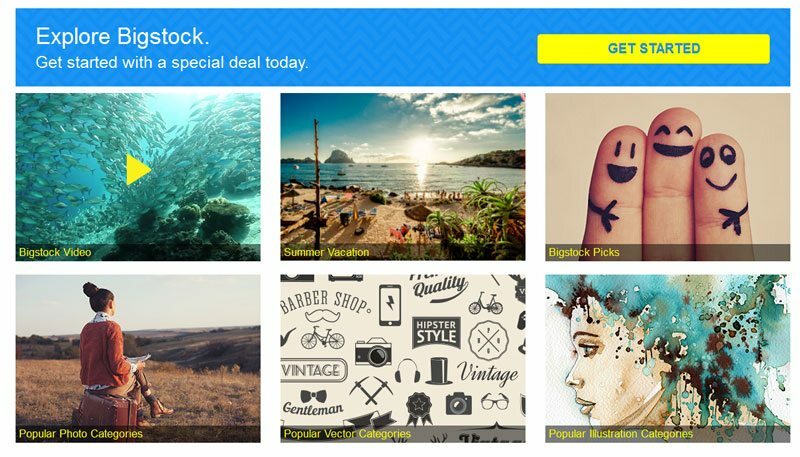 BigStock is considered an accessible site with good payouts, so it might be one to start with. Learn more about BigStock here. Basically, any image or design that can be sold via download is fair game for online stock houses. Here’s a list of 15 top stock houses that you might want to consider if you sell any sort of downloadable art. Now we’ve looked at many ways you can put your works in front of large buying audiences, from art-focused online galleries, to Amazon and Etsy, to digital and print-on-demand outlets. Once your website is live, check out the marketplace sites featured above. Explore their terms, pricing, and, of course, the competition. Then try one or two on for size to see if marketplace selling is a fit for your creative works. Next, let’s see how you can put the power of your social media accounts to work selling your art. Selling art on social sites might be a misnomer, because listing items for sale on Facebook, Pinterest, and Instagram generally requires some sort of ecommerce platform that feeds your listings into these social sites, then accepts orders and payments. 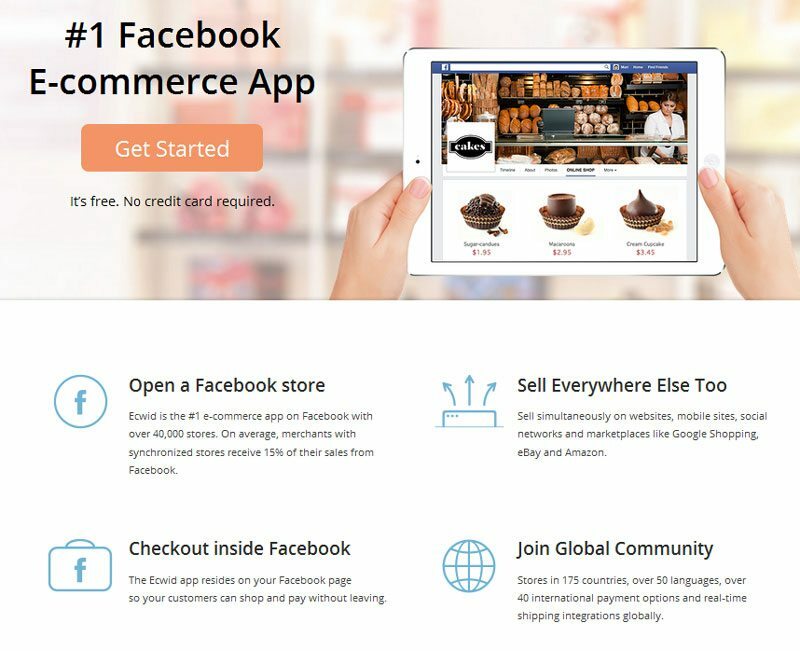 Many top online store platforms, including Shopify and Ecwid for WordPress, readily integrate with Facebook so you can create a Facebook Shop and sell directly to your social followers. Plus, many platforms also let you sell via Buyable Pins on Pinterest and Shoppable Posts on Instagram. Best of all, most social selling features are included at no additional cost. Once your art is listed on social sites, marketing your artwork can be extremely cost-effective, and even free. We have a guide that will help you get started here. Now let’s take a look at some ways you can sell art online using various social media sites. 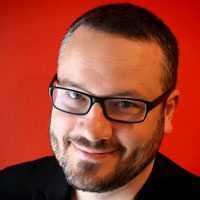 Price: Facebook Shop-only plan for $9/mo. Social selling included in all online store plans, which start at $29/mo. With Shopify, a Facebook Shop is included in all regular online store plans at no additional cost. 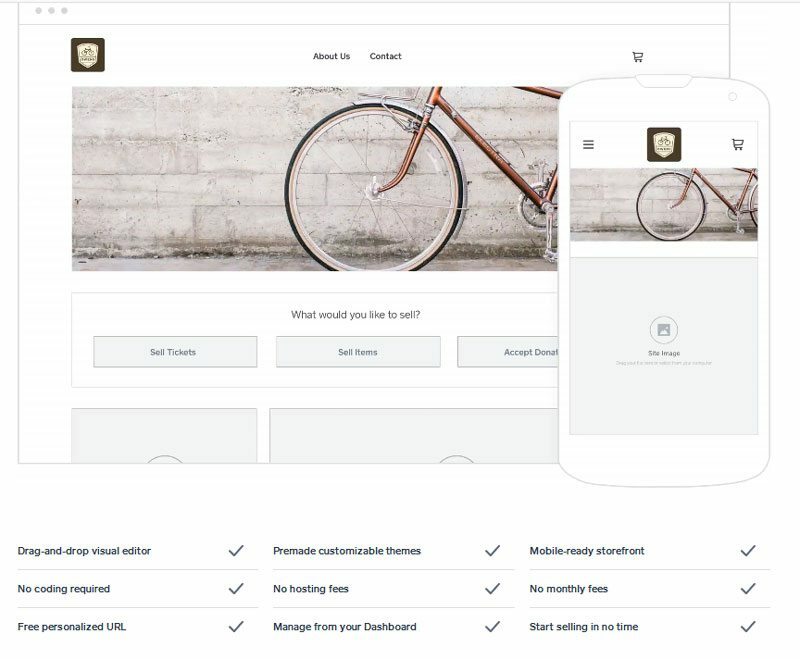 Here’s a look at Shopify’s Facebook Shop features, plus we have a guide that walks you through Shopify’s Facebook Shop setup, step-by-step here. Shopify supports Pinterest’s Buyable Pins, too on its regular store accounts. More than 10 items starts at $15/mo. Ecwid is one of the leading shopping cart solutions for WordPress sites and offers a free Facebook store if you list just 10 items or less. This is a great no-cost way to test-drive social selling for your artwork. Learn more about selling on Facebook through Ecwid here. If you don’t have a website, or if yours doesn’t play nice with social media sites, then Spreesy will let you sell your art online through every major social site: Facebook, Instagram, Twitter, Pinterest, and more. It’s pretty slick! Learn all that Spreesy has to offer here. As you can see, social selling is serious business. 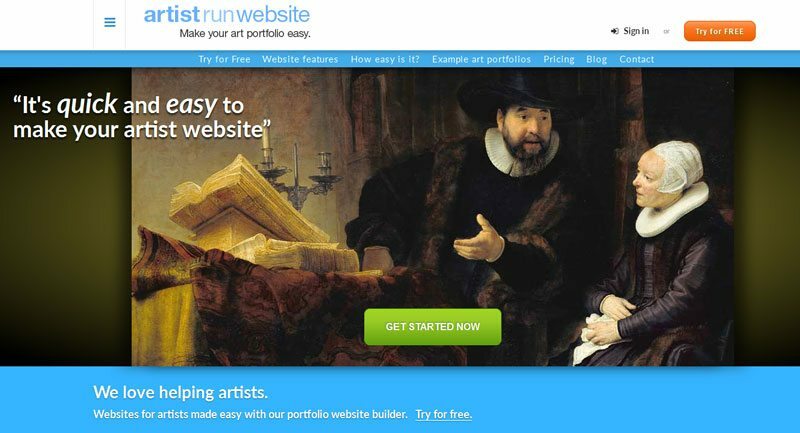 Paired with your own website, it might be all you need to start selling art online. Or you can add in a marketplace or two and see where your creations take you. And remember! However you choose to sell, there’s one main thing you’ll need for online selling success, and that is: Great images of your artwork. See how to capture great images and fine detail shots of your artwork using just a cell phone camera in our article here. 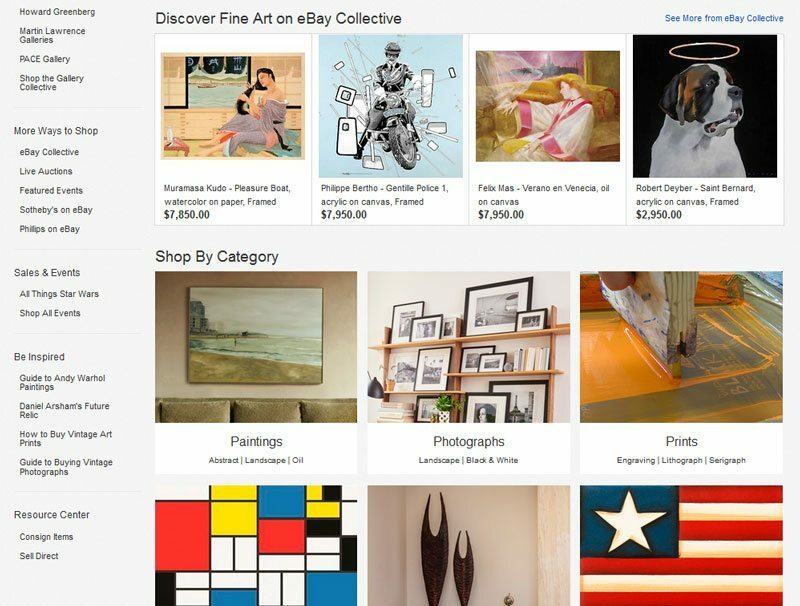 There’s a huge demand for art, and an equally huge online art market that serves all types of buyers. As a busy artist, putting together a solution that hits all of your selling targets can be daunting, but not if you take it a step at a time. Start with your own website first — then branch out from there. Once you have your website running on Shopify, WordPress, Artist-run Sites, or whatever platform you choose, test some works on larger marketplaces. We cover some top choices above, but that’s far from an exhaustive list. Spend some time searching the art marketplace and online gallery landscape. Check out fees and pay structures, and try a few on for size. And don’t forget the mass-market sites Etsy, Amazon, and eBay. They can drive sales your way, too. And look around, art is everywhere. On tees, on totes, on mugs and cell phone covers. Should yours be there, too? If so, upload some of your creations to POD vendors and sell art-embellished items on your own website with no money down. Or try out Fine Art America’s unique POD marketplace. You might score a following you never expected. And use those social tools! After all, most online stores like Shopify and Ecwid support them at no additional costs. Or try Spreesy if you don’t have a website going yet. You’ll only see a fee when you sell something, and that’s a price you’d happily pay over and over again. Thank you for all the info. Like many trying to start a “Virtual Gallery” , visited Etsy and Ebay and Facebook … fascinating learning experience, working on a website. One question : Shipping?????? I paint large canvas ( 1.50 m*1.50 m , 1.00 m *1.50 m and so on) how to ship cost efficient and safely. Shipping is tough because you pay by the square inch – and yours are BIG! I’d recommend really scoping out your box options and finding the smallest box that will safely carry your art, then use large cardboard or foam sheet inserts and corner pieces to further protect the painted side from punctures and corners from breakage. Last, try using shipping comparison software to compare rates among carriers to ensure that you pay the lowest rates on every shipment. Hope this helps, good luck! Hello I am writing in regards to wanting to sell artwork from paintings and photographs of various forms and types and sketches,and stencil artwork and occasionally clay work and created by myself. I am not really interested in Facebook or Pinterest or Instagram or even Let It Go,Kijiji or eBay or Amazon types of online social media sites as they take long periods of time and often doesn’t pay for the time spent on the sites. I am looking for sites to post them and sell rather quickly while it doesn’t have to be for very much money as I am not trying to overcharge for anything. Also looking for sites for blogs/writing sites to write such as some examples are The Mighty and so forth. And information regarding starting a free online website and perhaps an app available on main search engines and more attention than the websites that appear to be spam or so forth. Any suggestions would be greatly helpful and appreciated as I am beyond passionate and experienced in the work experience just not as much as expanding and advertising my own personal work. Some of the print-on-demand listings in the article above, paired with your own WordPress website, might be the right combination. I’d give that a try to get started. I hope this helps, good luck! Thanks for the added resources — there are a ton of options and I personally love IndigoFair, too. That’s a great startup outlet for art sellers, artisan products, and more. Hi Krista, Thanks for the clear guide to sell art on online. Thanks for sharing this post with us. Keep sharing. Looking for the more valuable post like this from you. I’m glad the information is helpful to you! Thanks for giving it a read.